Cast: Brie Larson, Samuel L Jackson, Annette Bening, Jude Law, Lashana Lynch, Gemma Chan, Clark Gregg, Ben Mendelsohn and Goose the cat. Carol Danvers (Brie Larson) is a Starforce warrior on the planet Hala. As she is named on the planet, Vers doesn’t remember her past. She sees flashes and tries to connect the threads. The home of the Kree race is ruled by an AI called the Supreme Intelligence (Annette Bening). Along with her mentor Yon-Rogg (Jude Law), Danvers fights against shapeshifting, cunning Skrulls who infiltrate and then take over planets. During one such intergalactic mission, Danvers gets separated from her crew and finds herself in captivity of Skrulls. The escape from their clutches leads her to planet Earth. Here, she meets SHEILD agent Nicholas Joseph Fury (Samuel L Jackson), who out of depth himself, stumbles upon the real point of contention between Kree and Skrulls. During this journey to figure out a solution to this problem, Danvers discovers her past as an Air Force pilot and her future as the most powerful superhero this universe has seen. Brie Larson as Captain Marvel is amazing from the get-go. She embodies the character in the way she carries herself, the confidence, the poise is infectious. She also has good comic timing. It comes out in brilliant flashes in the tense situations and especially during her buddy-cop banter with Samuel L Jackson’s Fury. This is Larson’s story to shine. She has your complete attention no matter who she is sharing the frame with. Her chemistry with Lashana Lynch, Carol Danvers’ friend from the Air Force, is impeccable. 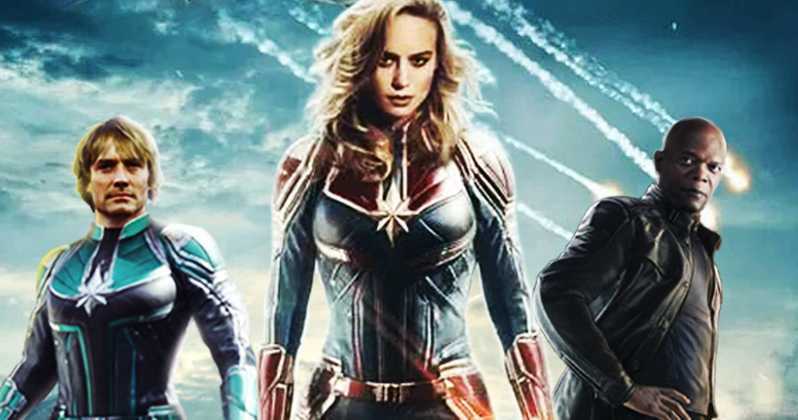 The cast of the movie works together to prop up Captain Marvel. Samuel L Jackson, sorry, young — in his 40s — Samuel L Jackson is a delight. Whenever his de-aged face is on screen, you cannot focus on anything else. It is far more amusing than what we saw with Michael Douglas as young Dr Hank Pym Ant-Man. Sadly, this is where technical superiority ends. Captain Marvel’s origin story is the biggest clusterf—k of Marvel Comic books. For some reason, director duo Boden and Fleck thought keeping the past in congruence with the written word is a good idea. Therefore, despite Kelly Sue DeConnick’s revival in 2012 serving as the basis for this movie, you never get to know Carol’s real origin. After a point, the flashes from her past hurt the pace of the movie. Goose the cat deserves separate mention because of some adorable moments with Jackson and a whole lot of incredible situations in the climax scenes! Patchy editing, lazy action scenes, and mediocre visual effects are a few issues with this superhero movie. Nothing a loyal fanbase can’t ignore. Captain Marvel is a good movie that finally gives a superhero with practically zero chinks in her armour. She will take out your Iron Man, Captain America in a single punch. It’s a huge plus that she is a female role model little kids can look up to. It has taken 10 years and 20 movies for Marvel to deliver a female-led solo feature. Therefore a pat on the back just for establishing the character that shall take the centre stage in the coming phases of Marvel Cinematic Universe, starting with highly-anticipated Avengers: Endgame. PS – Arrive early to watch Stan Lee tribute. Do not leave the theatre without watching the two end credit scenes.